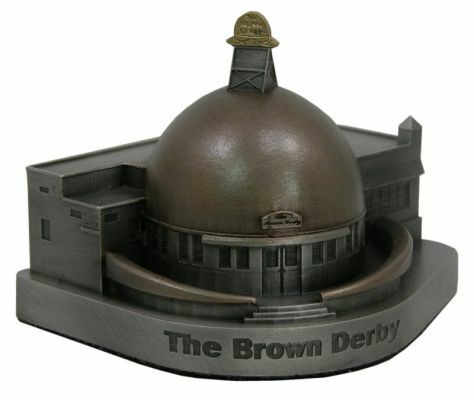 The Brown Derby is located at 3427 Wilshire Boulevard in Los Angeles and was completed in 1926. This particular Brown Derby restaurant was the only one shaped like a hat and it currently has been stripped down and moved atop a mini mall. The Derby was also famous for the creation on the Cobb Salad, named after one of its owners, Bob Cobb. This pewter replica stands a little over 2-1/2 inches tall by 3-1/4 inches wide and is finished in antique pewter with brown stain on the hat and gold highlights on the sign.